As a few of you have maybe heard, Monty Oum, the creator of RWBY, passed away yesterday. I thought I'd honor him by drawing Lie Ren, the character he plays on the show. Sigh. It still feels like a bad dream. 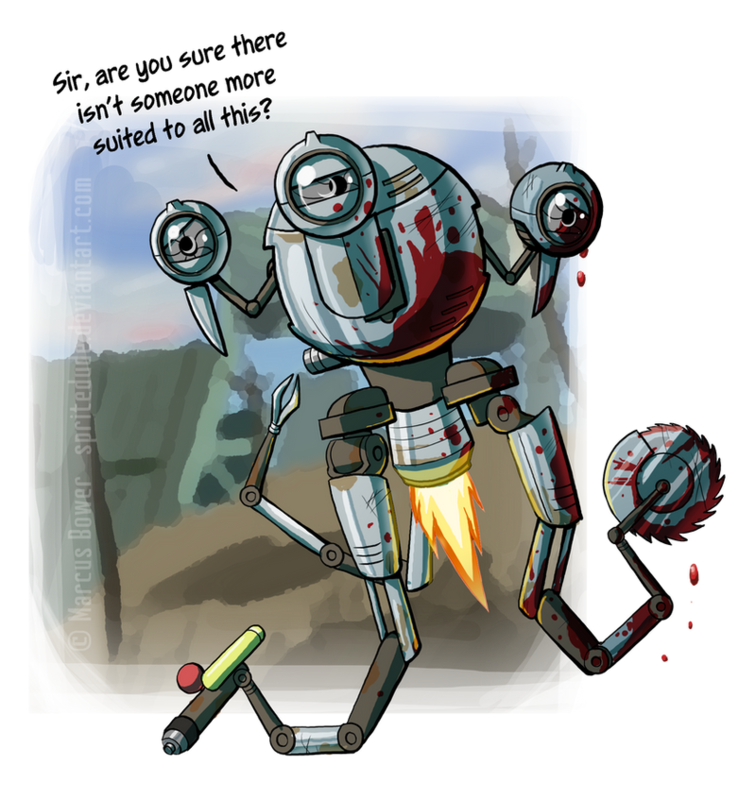 Monty was the absolute epitome of resolve. It's not enough to have ideas, you have to have the drive to bring them to fruition, and Monty never wasted a minute doing so. So for him, I'm making a change. Here I've been bitching about not having the motivation to draw every day, and here this man spent every waking second of his life working to bring his ideas to life. For you, Monty, I'm going to strive to be the best goddamn artist I can be. I will spend every ounce of my being to bring my own ideas to life, and I won't waste a single day in doing it. After all, tomorrow is never a promise. EDIT: Added his ponytail blowing in the wind to give the drawing more action, and messed with the colors. Aaaaaand we're back. So since last time I've finally upgraded my tablet to a Wacom Cintiq 13HD. Compared to my old 12WX it's a lot lighter and thinner. I guess the screen is a little bigger and the resolution is better too but I'm mostly just thankful for how much more accessible and less clunky it is. Time to share what I've been doing with it, I suppose. I know this was already posted in the art theme thread but I'm particularly proud of this one. For all the frustration and self-doubt I go through as an artist, this was one of the few times I stopped and thought, "You know what, being an artist is kind of awesome." I've been a fan of Pokemon since I was 5, and now I don't have to settle for just imagining myself as a Pokemon Trainer, I can bring it to life. Well, sort of. This is probably the closest I can get. And here's another one I drew for my cousin, Link456. He wanted a new avatar for when he returns to VGF, so he requested I draw him in a blue tunic and holding drum sticks, doing Link's taunt from Smash Bros. He said he'd start posting again once I finished this, but I think he's putting it off. Go bother him about it on Facebook or something. Just finished this one. I really liked the Yooka-Laylee drawing I did in iScribble, so I decided to do something with it. One thing I've been trying to practice in preparation for drawing my comic is drawing characters in an actual environment and making them look like they belong in it, and not just slapped onto a background. Man I love Laylee. I will forever imagine her with an adorable English accent thanks to that one flash cartoon (not australian im sorry for being so uncultured). Just looked at the OP's earliest pictures and now these pictures you posted, and you've greatly improved. Nice stuff. I love what you did with that one, Sprite. Looks seriously boss. Woah, my characters can talk? I'm getting pretty close to starting my comic (if I had a nickel...), but there's a few last things I kind of want to practice and assure myself of. One of those things is drawing expressions, and giving my characters life and personality, so I thought I'd do a bunch of reference sheet things like this for every one of my characters so I can really get them all down. Thorn's weirdly shaped face has always given me trouble, so I thought I'd start with him. I have this little wolf bust on my desk that actually works really well for reference. Some traditional art for once, done with Copic markers. Marky Mark and the Funky Bunch. I gotta see if Markiplier has a PO Box or something cause I'd love to send this to him. ...Man he's one handsome devil. An uh, this isn't a drawing but it's still the art of Spritedude, right? This was a birthday present I made for my cousin (Link456's younger brother), a diorama thing of his favorite League of Legends characters: Blitzcrank (the gold robot guy), Ziggs (the little dude with the red bombs on his back), and Teemo (the little scout guy with the green hat). This was actually really fun to make. My local library (which also happens to be where I work) has a 3D printer that anyone can use, so I found some models of the characters online and got them printed. Then I glued them to a wooden base and painted them, and then added model fake grass stuff. I may have to make one for myself now with my own favorite LoL characters. All of that looks really bitchin', Sprite. I like the reference sheet with all the diverse poses, the portrait actually looks like him, and the diorama looks really sweet but I'm blinded by jealousy of your access to a 3D printer. Holy ****. All that looks absolutely amazing! Keep it up! I love those copics man, and your work with them looks brilliant! Your improvements are really inspiring, Sprite. I really need a 3D printer myself, that piece looks great now that you've painted it. So you know a while ago when I was doing requests from deviantART? Well, one of them was from RU, of his character Vivian Fynity. I kinda got bored with the requests thing after a while and never got around to doing his. I always felt kinda bad about it, so, almost two freaking years later, I figured better late than never. Love the character design, first of all. A lot of fun to draw. I did some more experimentation/practice with a few things on this one, particularly line weight, ambient lighting, and textures (like on the metal boots and the staff). I really like how the eyes turned out. Maybe cause it finally occurred to me how they're supposed to be drawn in 3/4 view. The farther eye doesn't get smaller, just squashed horizontally. This one's a concept sketch of a villain character from my comic. His name's Edge. He has the ability to protrude bone spikes from his body. ...I'm not sure how they don't tear up his clothes more. Maybe it can be one of those unexplained comic book mysteries, like how only the bottom half of Hulk's pants rip off. And uh, this is barely worth sharing but I thought it was funny. Just a joke I made while talking with some friends that I decided to draw. I doubt I'm the first to come up with this idea. ^ Edge looks cool, kinda feels like a three-way cross between Johnny (Chrono Trigger), Kimimaro (Naruto), and Kaneda (Akira). Wasn't expecting this today, but I really like the Vivian drawing, Spritedude! Thanks a bundle! I, too, think Edge looks cool. Biker designs are really rad. You know, looking back up at the drawing of Vivian, I'm a little amazed at how freaking good it came out. The linework, the lighting, the highlights... Everything about it just pops. Sorry, it's not often I'm this impressed by my own work, just needed that moment. ANYWAY, MOAR STUFF. First, just a drawing in my usual style. 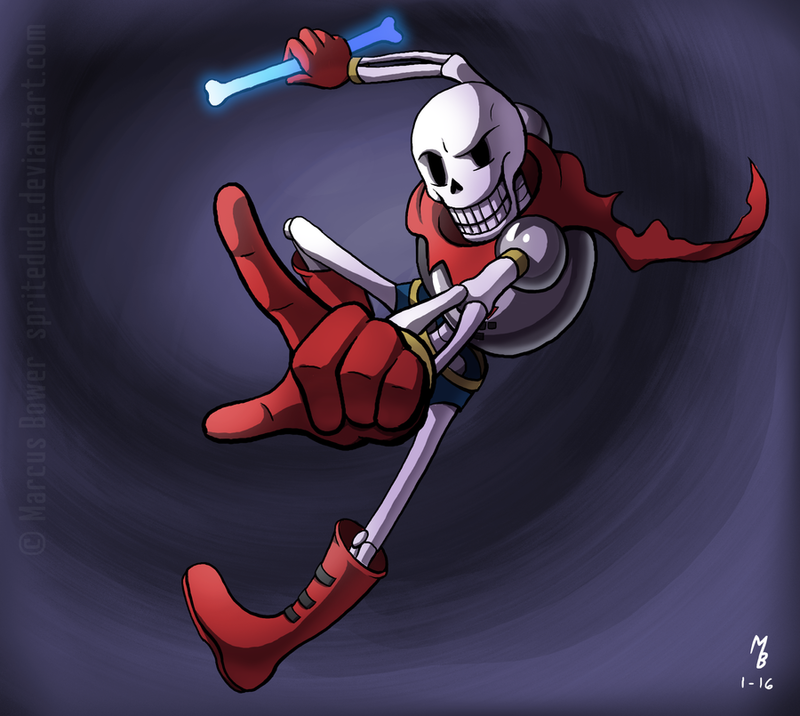 I got around to playing Undertale (and I mean all of it, including Genocide), and Papyrus was a cool dude, definitely needed to do fan art of him. Not much else to say on this one besides I like how the pose and foreshortening came out. So, the thing I've been experimenting with most lately is actually a more "painted" style. I'm not replacing my usual cel-shaded comic book style, but stepping outside my comfort zone has been refreshing, and it's given me a chance to better understand the behavior of light and such. As in my cousin Link456, who still hasn't returned to VGF despite me making him an avatar. Go bother him about it on Facebook. Anyways, this one was pretty easy since I was just going off an actual picture. All I added was the blue-green light coming from the side. 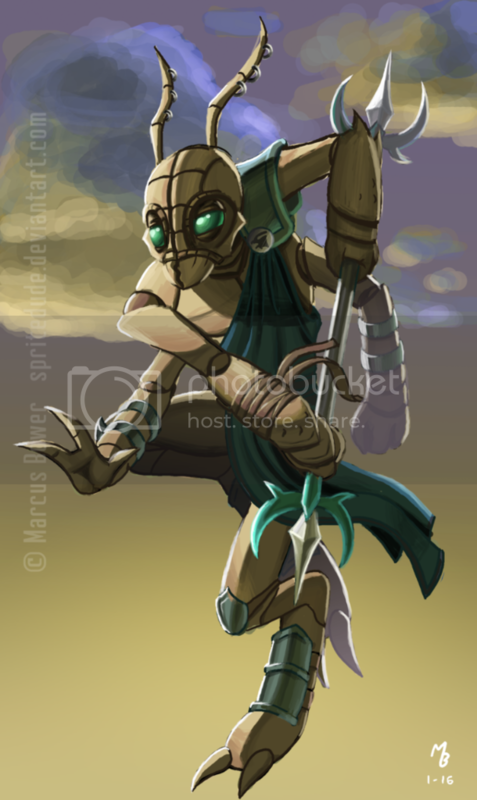 Stix the Thri-Kreen Monk. I tried keeping some of the lineart showing to get a hybrid outlined/painted look. I didn't have any real bug-men to go off of so I just had to wing it with the lighting. I actually used The Fly as reference for some parts, like the eyes. Then I thought I'd try painting one of my own characters, so I went with my alien dragon buddy Thorn. 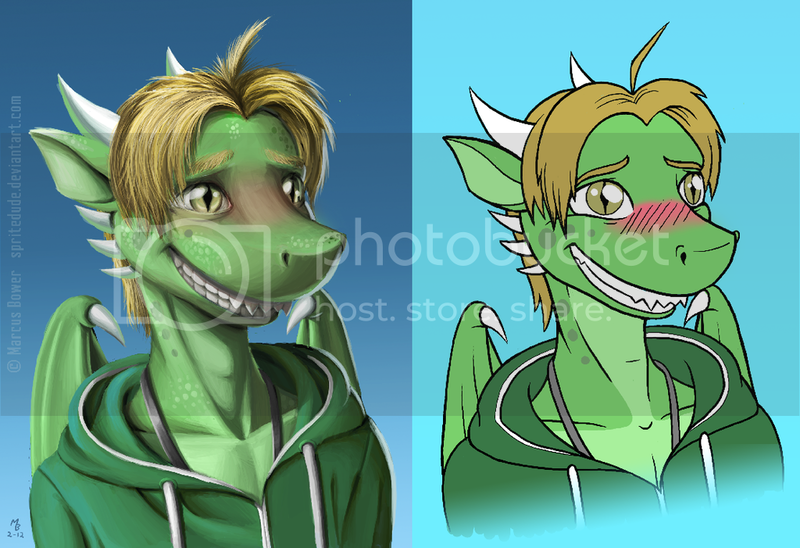 I just used one of the drawings from that expression sheet I did of him, which I've included here for comparison. God this one took forever. Not perfect, but it turned out way better than I could've imagined. The only thing that looks off to me is his hoodie, which looks like it's made of... I don't know, clay or something. Guess I'll have to look into painting different textures like cloth. And last, something traditional. I did a Bob Ross style painting on a canvas, but I added my own flair to it. Which of course means dragons. ...It's too big to scan so here's a picture I took with my phone. Kinda screwed up the scale. That must be one gigantic castle up there. Awesome work, mate. Those are showing some big improvements in how you handle light and colors overall! I'm especially digging the third and fourth ones, they're absolutely lovely. That castle one looks awesome. Just two pieces of fan art this time. I told myself I didn't need to draw any more Undertale art (god knows there's enough of it out there), but one of my friends pretty much begged me to draw Sans, so... here ya go. 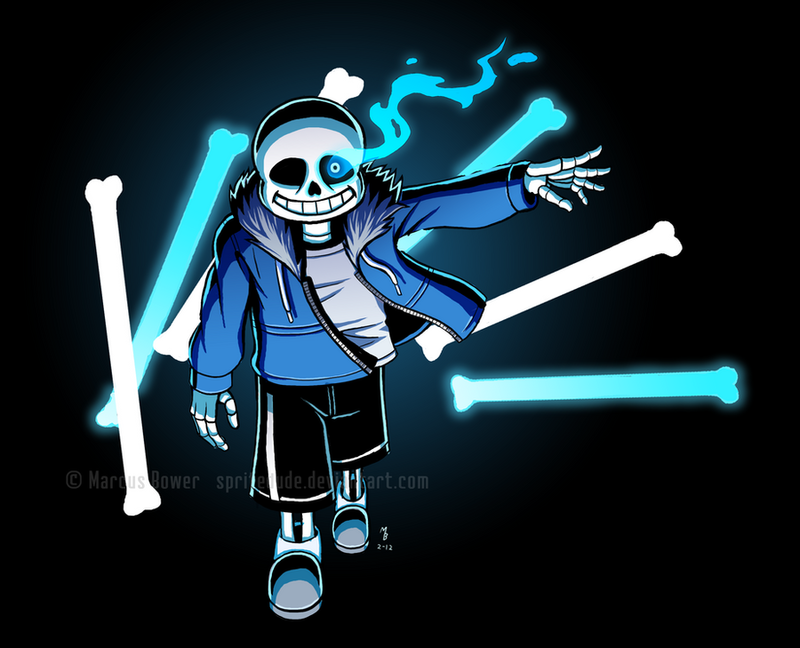 This picture of Sans with the bones and the glowey eye has been done to death but I thought I'd try to make it stand out with the hard black shading. Dangit VGF, how are people supposed to read that text over your dark blue background? Great work, as per usual. Nice that you're still boning up on your art skills.